Sometime in the Late Bronze Age, around 1300 BC, a group of Semitic people living on the Mediterranean coast in modern Lebanon became more important than they had been before. These people, who had been called Canaanites, were now called the Phoenicians (foy-KNEE-shans). They became more important because the kingdoms which had been controlling them before (mainly the Egyptians, the Hittites, and the Assyrians) got weaker. So the Phoenicians were able to get a little stronger and more independent. The Phoenicians became excellent sailors, and traded all over the Mediterranean, including to Greece. During the Dark Ages, the Phoenicians got even stronger and began to start colonies all over the Mediterranean: new cities in new places with Phoenician people living in them. One of the most important of these colonies was Carthage, in Africa, but there were many others. 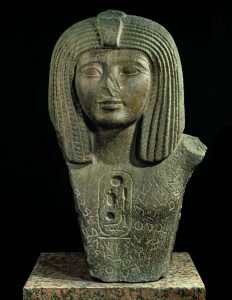 Pharaoh Osorkon I with hieroglyphics and an alphabetic inscription. Ca. 924-895 BCE. Egyptian, found in Byblos, now in the Louvre. After the Dark Ages, in the 800s BC, the Phoenicians started to use iron. They traded with the Greeks again, and now also with the Etruscans. They learned the alphabet and taught it to their trade partners. But in 539 BC the Phoenicians, like everybody else in West Asia, were conquered by the Persians. They became part of the Persian Empire, and the main part of the Persian navy. Because the Phoenicians had been conquered, they could not run their colonies anymore. So Carthage and the other Phoenician colonies became independent. 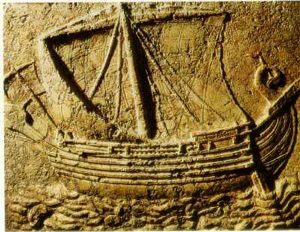 In 332 BC Alexander the Great attacked the main Phoenician capital, and the head of the Persian navy, Tyre (like a car tire). After a long siege, he captured Tyre, and the Phoenicians became part of his empire. Ancient Israelites and Their Neighbors: An Activity Guide, by Marian Broida and Scott Noegel (2003). Activities covering Philistines and Phoenicians as well as Israelites. The book tends to mix fact and story, not making it clear what we know from archaeology and history, and what comes from the Bible. The Phoenicians and the West : Politics, Colonies and Trade, by Maria Eugenia Aubet (1993, revised 2003). Mainly about the Phoenician colonies in Spain. Ancient Near Eastern History and Culture, by William H. Stiebing (2002). Expensive, and hard to read, but it’s a good up to date account. A college textbook. Cite this page: Carr, K.E. Who were the Phoenicians? West Asian history. Quatr.us Study Guides, September 14, 2017. Web. April 22, 2019.